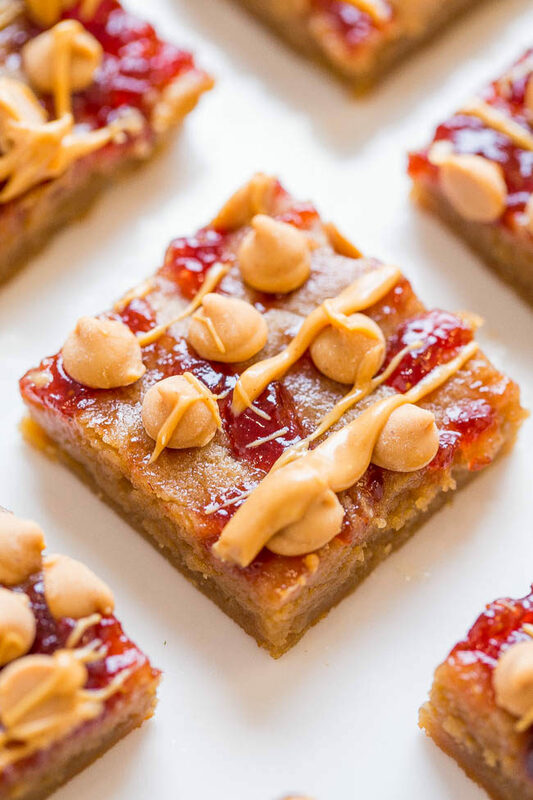 PB & J Bars – Super soft peanut butter bars topped with strawberry jelly, peanut butter chips, and a peanut butter drizzle!! Fast, EASY, and they’ll be your new FAVORITE way to eat PB & J!! Post is brought to you by Santa Cruz Organic. The recipe, images, text, and opinions expressed are my own. Peanut butter and jelly is an all-time classic that you can’t go wrong with. 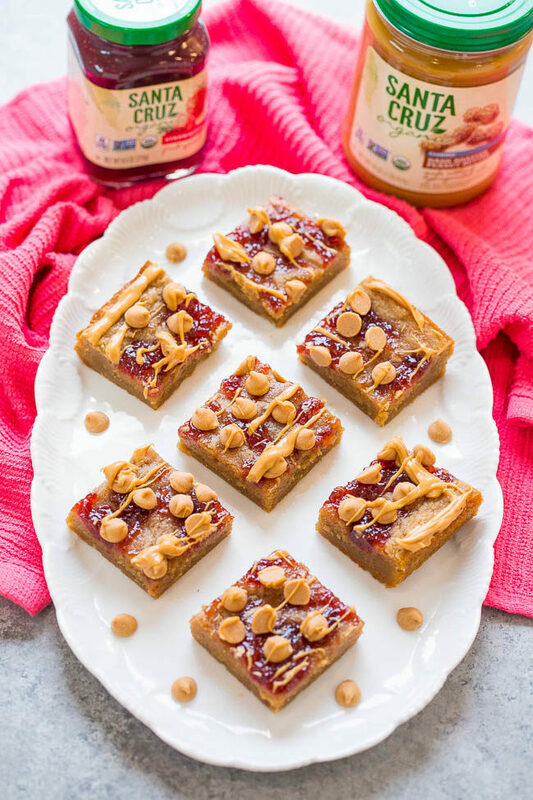 These super soft bars that are brimming with peanut butter flavor and topped with sweet strawberry spread, peanut butter chips, and a melted peanut butter drizzle are a definite swap up from a PB & J sandwich. School is right around the corner, and I know every kid would love to open their lunchbox and see one of these staring back at them. And I know many adults who would enjoy that too. 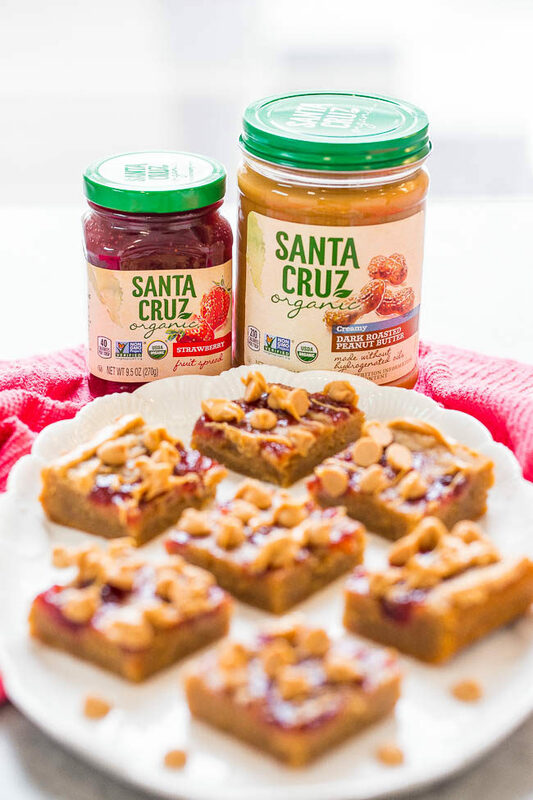 You can upgrade your child’s lunchbox or after-school snacks with delicious Santa Cruz Organic® products. 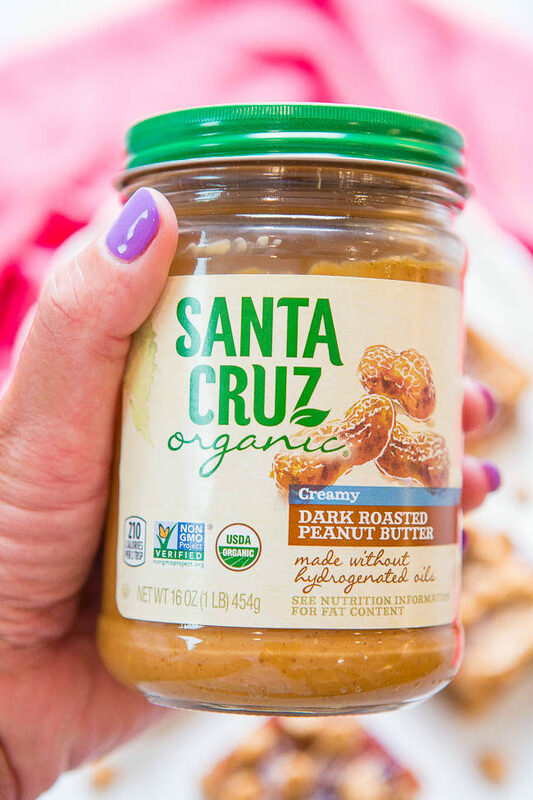 With organic apple sauces, peanut butters, and fruit spreads, Santa Cruz Organic makes it easy to nourish your entire family with delicious, high-quality ingredients. For the bars I adapted my infamous blondie recipe and used Santa Cruz Organic® Peanut Butter in Dark Roasted Creamy. It keeps these easy, no-mixer bars so tender and moist. The peanut butter drizzle on top is the proverbial icing on the cake. For the strawberry element I used Santa Cruz Organic® Fruit Spread in Strawberry. It’s perfectly sweet and of course complements the peanut butter beautifully. I have a video demonstrating just how fast and easy the bars are to make. 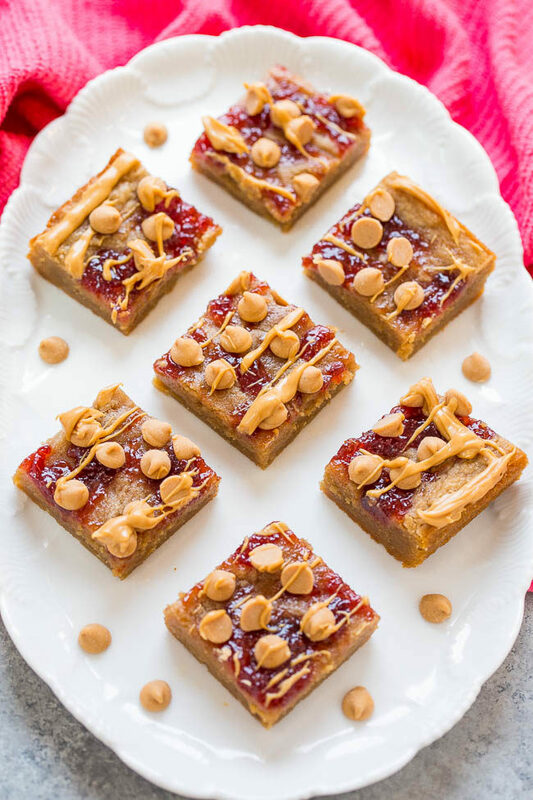 You and your kids are going to love sinking your teeth into this kind of PB & J.
Peanut butter and jelly is an all-time classic that you can’t go wrong with. Especially when you’re talking about super soft bars that are brimming with peanut butter flavor and topped with sweet strawberry spread, peanut butter chips, and a peanut butter drizzle. 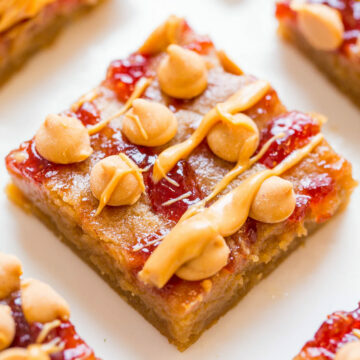 The peanut butter keeps these easy, no-mixer bars so tender and moist and it’s perfectly complemented by the strawberry spread. Add 1/3 cup peanut butter and whisk the butter and peanut butter together until smooth and combined. Turn batter out into prepared pan and smooth the top lightly with a spatula. Evenly dollop the fruit spread over the pan in small teaspoon-sized ‘blobs’. Using a knife or spatula lightly spread it into an even layer; it will be thin and spotty and you won’t have completely coverage which is okay. Bake for about 21 to 25 minutes, or until done. Place pan on a wire rack to cool for at least 1 hour before evenly sprinkling the peanut butter chips or they will melt (not bad, but you won’t have the same visual appearance). Add 1/4 cup peanut butter to a small microwave-safe bowl, heat for about 20 to 30 seconds or until just beginning to melt, stir to smooth it, and lightly drizzle it over the bars before slicing and serving. Bars will keep airtight at room temperature for up to 1 week or in the freezer for up to 6 months. Can this be my lunch today? PB&J is my absolute fave sandwich. I know that makes me pathetic or boring or something, but it’s true. I haven’t heard of the Santa Cruz brand–I’ll have to be watching for when I shop. You had me at PBJ! These look incredible! My kiddos will love these bars! My oldest will have fun whipping these up for the whole family! I love these bars, since I can hardly go a day without a little peanut butter! Will these bars freeze okay? Said you can freeze up to 6 months. I would cut in squares, wrap individually and yes freeze! You left out putting the chips on in the written instructions. Do they bake? Step 8 is where I discuss that. These look like such heaven. I swear I’d eat the whole batch and not share at all!! Especially after I was up all night with puppy, ha! Oh no. I was thinking about that….that you’re like the mom of a baby again with a new puppy and it’s not easy! Yes you need a whole pan of these! Made these bars tonight, used skippy crunchy peanut butter ( this is what I had in the cabinet). Put strawberry preserve on top (this is what I had in the fridge). Put it on top after 21 min. of baking forgot. Baked 5 min. more Did not use 1/2 C of peanut butter chips 1/4 C was enough. And used half of the 1/3 C of peanut butter to drizzle on top. Yummo! Will try it w/ grape preserve next time. Definitely a keeper!!! Thanks for trying the recipe and I’m glad it came out great for you with swaps you made!